1. Irregular or missed menstrual periods or long time between periods. 5. Infertility or unable to get pregnant. 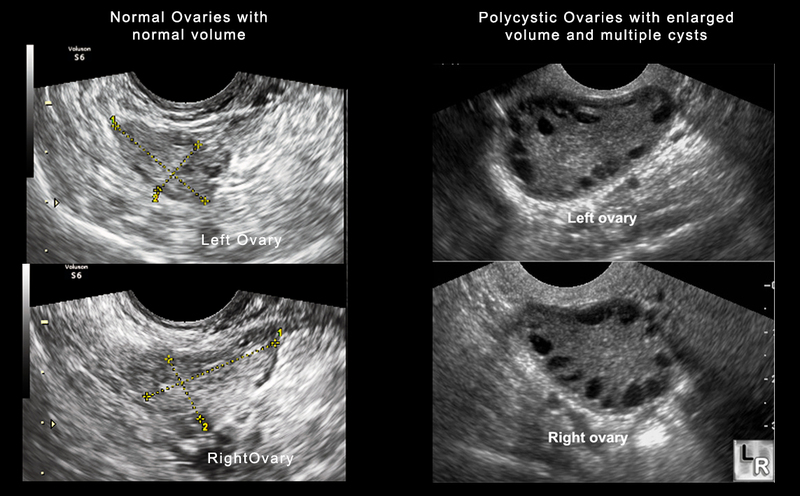 Enlarged ovaries with small cysts (follicles), more than 12 in each ovary. Although the exact cause of PCOS is not fully understood, but genetics maybe a factor. PCOS seems to run in families, so your chance of having it is higher if other women in your family have PCOS or have irregular periods or diabetes. PCOS can be passed down from either your mother’s or father’s side. Obesity, insulin resistance and hyperandrogenemia are pre-disposing factors for PCOS. What risks do women have with PCOS? Some of the risks are related to a woman not ovulating regularly. When ovulation doesn’t happen, it interrupts the usual hormone cycle and causes levels of estrogen making the lining of the uterus to thick and causing abnormal bleeding. Over time, it can lead to pre-cancerous changes or uterine cancer. This lack of regular ovulation can also make it difficult to get pregnant. 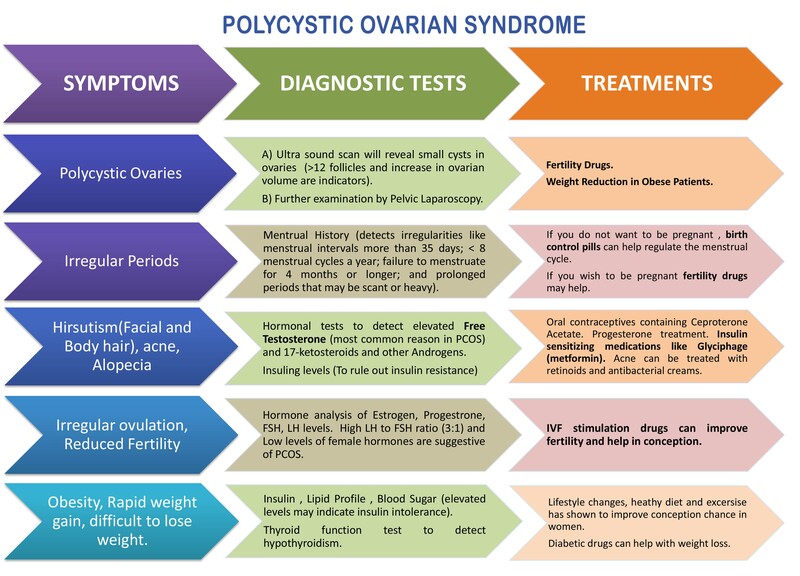 Metabolic syndrome is common in women with PCOS. Symptoms include extra weight around the middle, high cholesterol, high blood pressure, and insulin resistance/diabetes. Each of these symptoms raises the risk of heart disease. Obesity is common in women with PCOS. 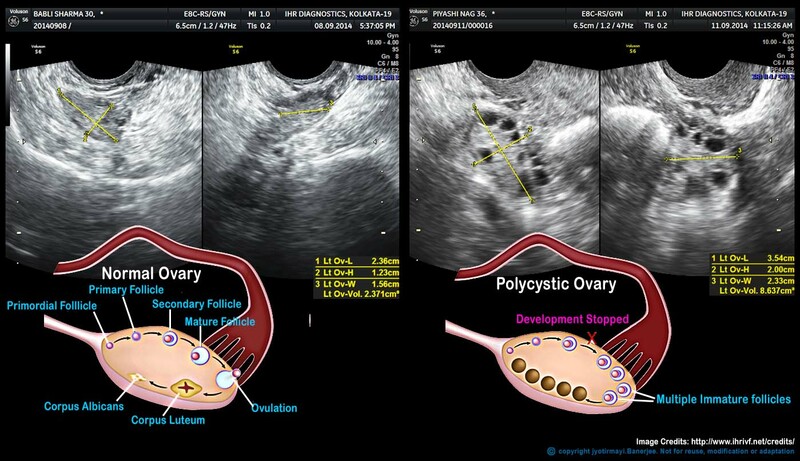 How is infertility in women with PCOS treated? One way to treat infertility is to cause ovulation using medicine. Clomiphene citrate is taken by mouth and has usually been tried first. Letrozole is another oral medicine that can be used and can be particularly helpful in patients with PCOS and is often tried first. If this is unsuccessful, injected fertility medicines called gonadotropins may be given to stimulate the growth of an egg. Women with PCOS must be watched very carefully when these medicines are used to make sure that they are not responding too much as this increases the risk of multiple births. If a woman is overweight, losing weight can help improve ovulation patterns and fertility. Insulin-sensitizing medicines such as metformin can help the body use insulin more effectively to improve ovulation in some patients with PCOS. This may also lower the risk of developing diabetes or metabolic syndrome. In vitro fertilization (IVF) may help women with PCOS get pregnant if other treatments do not work. How is PCOS treated in women not trying to get pregnant? If fertility is not the goal, taking hormone medication usually helps to correct PCOS symptoms. Oral contraceptive pills (the pill) are often taken to reduce extra hair growth and acne. The pill can also make menstrual periods more regular and prevent pregnancy and some types of cancer. Metformin can help lower the risk of developing diabetes or metabolic syndrome. Excess hair and acne can be treated with medicines that lower male hormones. Excess hair can also be removed using electrolysis and laser treatment. Losing weight lowers the risk of diabetes and high androgen levels in many women with PCOS. Treatment should be tailored to each woman’s needs, symptoms, and particular situation and may change over time. Talk with your health-care provider to find the best approach for you.